Symptoms appear when spinal nerve is compressed by cartilage (bone spurs) developed behind vertebral body. These symptoms vary depending on compressed sites in spinal nerve. 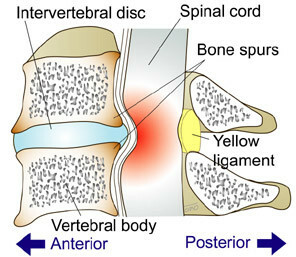 Cervical spondylotic myelopathy is a pathology which spinal cord is compressed by bone spurs. With this pathology, people often experience numbness and/or motor impairment of hands. The symptoms may appear unilaterally at first; however, they often progress to bilateral later on. Similar symptoms may also appear in legs. Gait disturbance, bladder and rectal disturbance are observed in some cases. Cervical spondylotic radiculopathy is a pathology which nerve root is compressed by bone spurs. With this pathology, people often experience neck pain, pain behind shoulder, and/or pain in fingers. 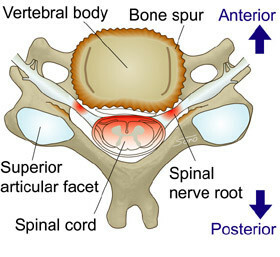 Numbness and/or sensory disturbance may present in the domain of compressed nerve root. There are options for surgical treatments. Here we present Anterior Cervical Discectomy and Fusion (ACDF). 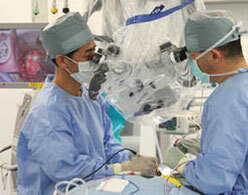 Precise and delicate operation is required to ensure that spinal nerve is protected throughout each surgery. Using operative microscope is necessary to achieve this. Operative microscope is also advantageous to preserve as much muscle tissues as possible during Minimally Invasive Surgery (MIS). First, a small incision is made around neck skin. From there, we reach to cervical vertebrae by following tissue boundaries. This way, we can avoid possible damages to muscles if done otherwise. Intervertebral disc is removed to excise bone spurs. Bone spurs compressing spinal cord are scaled using high-speed drill. After spinal nerve is decompressed, screw-like metallic implants called cages are inserted to the disc space to fuse upper and lower vertebrae. It is important to fuse both upper and lower vertebrae when they are moving excessively. This procedure enables patients to leave their beds early after operation. In many cases, symptoms should clearly improve if herniated disc is removed in early development. Copyright(C)　2008-2012 Junichi Mizuno All Rights Reserved.